The other night, we hosted a Mexican dinner party. Mariachi played on the iTunes, my famous margaritas were flowing, and the menu was robust. In other words, I made too much food. We began with chips, guacamole and salsa, and moved on from there to chile rellenos and queso fundido, while a fruity Baja shrimp cocktail stood by in the fridge. For the main courses, pal Nat Parker brought several pounds of skirt and flank steak from the new celebrity lesbian butchers near his work, and I slow roasted a pork shoulder crossed between Yucatan cochinita pibil and Monica Schneider’s Dominican pernil — black beans and fried plantains on the side. By the time we got to the main courses, everyone was full and friend Jon was passed out on the couch. I woke the next morning with a surprisingly light hangover, and stumbled toward the kitchen in search of juice. Opening the fridge, the first thing I saw was my large bowl of Baja shrimp cocktail, forgotten and unserved. As you know, I hate to waste food. But there was little chance I would be able to eat two pounds of shrimp cocktail in one afternoon, especially with little support from the wife and kids. The following day it would be no good. And I was sad. Then, I remembered that we had dinner plans that evening at our friends Chris and Sue’s house. Chris was making a slow-cooked chicken dish with Kafir lime leaves and basil and coconut milk — and asked me to bring an appetizer. Now, of course, I would not bring a Baja shrimp cocktail as an appetizer to an Asian dinner. But I could improvise! There are distinct similarities between Mexican cooking and Southeast Asian cuisine. In addition to the shrimp, my Mexican cocktail also featured mango, onion and cilantro, all ingredients I might use anyway if I was starting from scratch. I removed the shrimp from the fruity Baja cocktail marinade, and washed them off — allowing cilantro and mango to come along for the ride. The tails and shells removed, I chopped the shrimp finely, along with a bit of the pork shoulder I’d made for Cinco de Mayo. To this I added mint from the garden, chopped peanuts, more mango, the juice of a lime, some garlic, a drizzle of sesame oil and a splash of nuoc mam fish sauce. 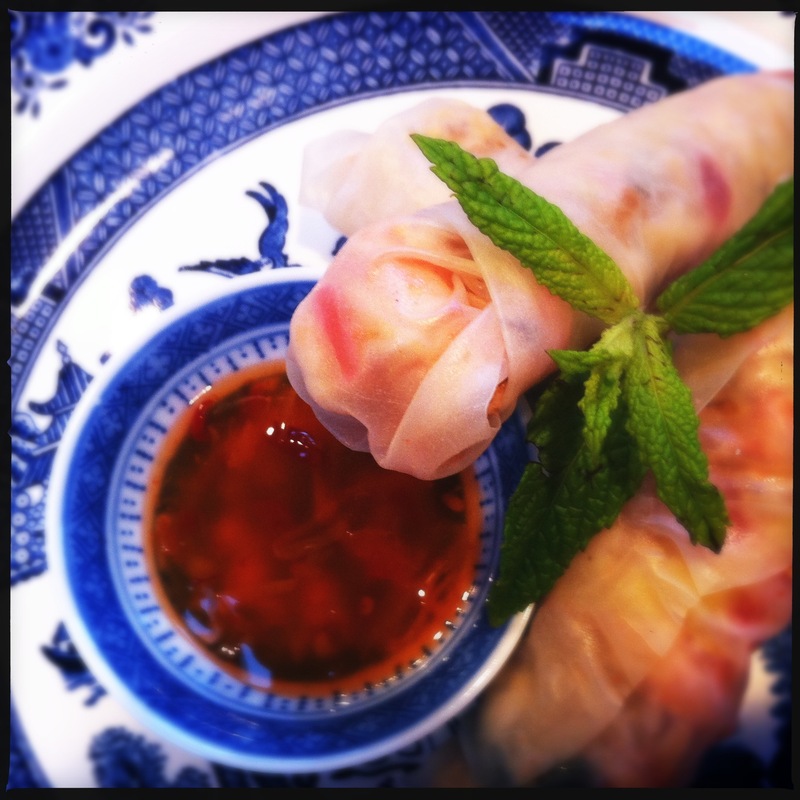 I wrapped them in some bánh tráng rice papers, and voila! A Vietnamese spring roll. Mix together the shrimp and the pork until thoroughly integrated. Add peanuts, mango, mint, onion, garlic, lime juice, sugar, fish sauce and sesame oil and mix vigorously (I use my hands!) until you’ve created a sticky filling. Two or three at a time, wet the rice papers and lay them out — not touching (they will stick together) — on a wooden cutting board. Put a heaping tablespoon of the filling into the center of each. Begin rolling, tucking the side edges in, as you would a burrito. When the spring roll is finished, set it aside on a platter. Continue in this manner until all filling is gone. You should have between 10 and 14 spring rolls. Make the sauce. Combine the lime juice, water and fish sauce, and stir in sugar, whisking vigorously until it has dissolved. Add garlic and red pepper, stir and set aside for 30 or more minutes to let the flavors integrate. My mom used to always say it wasn’t a party unless we left something in the ‘fridge that we forgot to serve. Good save, though! Thanks! And good saying, Mom. This appeals to me, I am the master of no waste. I was at an impressionable age during WW2 when we were admonished to ‘clean our plates because there were children in Europe starving’. I’ve never forgotten it. All my favorite charities have to do with children in need. I don’t know how it happened but I’m glad my son inherited that gene. The apple doesn’t fall far from the tree, I guess. And lord knows, we don’t let it waste on the ground once it does! I just threw all my remaining leftovers from Cinco de Mayo — roast pork shoulder, black beans, stale tortilla chips — into a pot to make tortilla soup. Somebody stop me!! !